Hello! Warm greetings in the new year 2017. I’ve been quite active of late and have let some time go by with no new posting. I’ll begin anew today, in remembrance of January 13, 1991, (26 years ago) Lithuania’s Defenders of Freedom Day, with thoughts of a favorite poet of mine, Al Žolynas. The author was first brought to my attention by my aunt who subscribed to Lituanus, a journal of Lithuanian culture and history. I remember her cutting the poem out of the book to share with me some thirteen years ago. It reminded her of family. She later gave me the Lituanus containing the poem, neatly taped back in place. I’ve read it many times since. Last year I searched for Mr. Žolynas online and was very surprised to locate him. I asked about our favorite poem, One More Attempt At Self-Definition. He generously agreed to my request in sharing his poem, and seemed genuinely happy it would please me so. His writing depicts a deep understanding of his subject matter. Another of his thoughtful poems, At My Father’s Ancestral Farm, (near Šunskai, Lithuania) he speaks dearly of family and home in both past and present tense. Pulling out one of my old maps, I pinpoint Šunskai. Just south, I find the region of my own ancestor’s homeland. A nice connection. It’s wonderful to imagine a place through the words of another. Creative profound words that bring visuals to life as though we are walking in their footsteps. This is what comes to mind when I read his poems. I’m half Lithuanian and half Scottish. Growing up with family traditions are meaningful, especially at the holidays. My great-grandparents (mom’s side) lived in a heavily forested area by the Merkys River in Merkinė, the southern region of Lithuania. Mushrooming and farming were part of daily life. They were gatherers, steadfast and strong–nature lovers who thrived, fought, and died in the forests that sustained them. Wooden treasures clustered together on the dresser with a picture of my grandmother, Monika. * Thank you Al Žolynas for allowing me to share your beautiful poem ~ enjoy everyone. or sink my toes in the dirt, or watch the birds fly by. 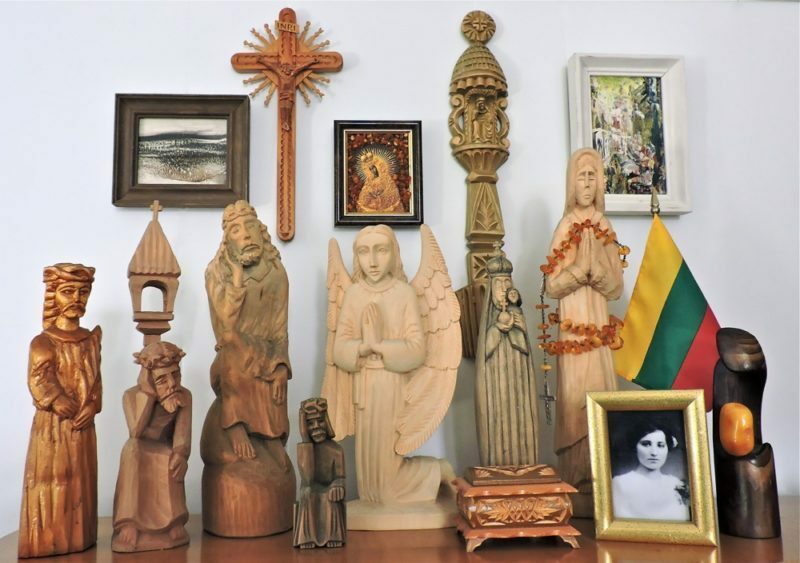 This entry was posted in Art, Family, Lithuania, Nature, Sculpture, Traditions, Writing. Bookmark the permalink.